Toto, I don't think we're on the West Coast anymore! Move a bit to the east, a bit more… yep, right there in Wisconsin! That's right folks, "A" and I landed in America's Dairyland a little over 2 weeks ago and have been attempting to set up our apartment ever since. I could go on and on about the trials and tribulations of moving, but I'll save your eyes. I assume most of you have moved at least once and know how it goes. Live on the third floor of an older house, discover you have a slight bat problem for the first week and live out of boxes for an unreasonable amount of time. You know, that ol' schtick. Since we moved our boxes in last week, we have managed to set up a bed, I finally put away my clothes and the kitchen. Oh the kitchen. It was the first thing we focused on and currently the only room worth cleaning. While we're still working out some storage issues, I am proud to announce that after being kitchenless for almost a month, I am back in business. I don't know if I've ever told you why I moved to Madison in the first place. I decided to be a bit cliche and move with my boyfriend for his job. Yes, there were a lot of tears at first. Yes, I miss Seattle every day and probably will for a while. But you know what? Madison is a pretty great town. The area we live in reminds me of SE Portland and people here really care about their food. I recently was offered, and accepted, an exciting job that I think will bring me down a perfect career path. To top all this off, I get to see the guy I love every day. To celebrate "A's" second week of work, I got down in the kitchen for the first time. Getting into a cooking project before you know how accurate your oven temp is or how the burners work is an experience. Definitely wouldn't recommend something fancy and French. Yet as we are all classy people here, it still needs to have a touch of elegance. Enter the tagine. 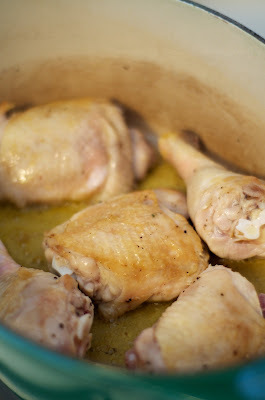 Starts on the stovetop, ends in the oven, low n' slow throughout. As we don't have a ton of counter space, I couldn't recommend prep bowls more. While no recipe demands them, I always think it makes whatever I make turn out better. Instead on frantically fussing around with prepping the next add-in, I can focus on how my food is cooking. You may already know this, but until last year (GASP!) when my mom bought me some prep bowls, I woefully was in the dark. Now that the world turned up the heat in the Midwest (again), I would recommend making this in the fall as the stovetop and oven need to be on for quite some time. 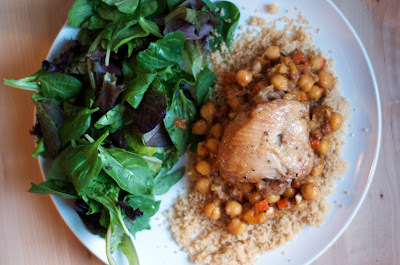 But when you decide to make it, know you'll be walking into a Moroccan, apricoty, fall-of-the-bone-chicken goodness! Warm one tablespoon of oil in a large Dutch oven (at least 5 1/2-quarts) or tagine over medium-high heat until the oil flows easily and you can see it shimmering. Sprinkle the chicken pieces with salt and pepper, and place as many as will fit into the pan without crowding (I had to do two batches of chicken). Sear for 5 to 8 minutes, flipping once, until both sides are golden brown. Remove to a clean plate and continue searing the rest of the chicken pieces. If necessary, add more oil to keep a thin film on the bottom of the pan. If the oil starts smoking, turn down the heat. Pour off all but a teaspoon of oil and return the pan to medium heat. 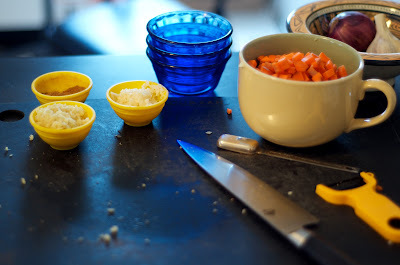 Sauté the onions and carrots with a half teaspoon of salt until softened and beginning to brown, about 10 minutes. Stir in the garlic and cook until fragrant, about 30 seconds. Sprinkle the ginger and spices over top and cook until fragrant, another minute. Stir the chicken stock and apricots into the pan, scraping up any seared bits that might be stuck to the bottom of the pan. Nestle the chicken pieces into the pan; try to fit them in a single layer, but it's ok if some pieces overlap. Bring the liquid to a boil, then reduce the heat to low. Cover the pan and transfer the covered cooking pot to a 300° oven. The tagine is ready when the chicken registers 165° on an instant-read thermometer in the thickest part of the meat and when its juices run clear. This should take approximately 90 minutes. While the chicken is cooking, prepare the couscous and set aside. Transfer the cooked chicken to a clean plate and tent with foil. Add the honey, almonds, and chickpeas to the pan with the apricots and onions, and cook at medium-high on the stovetop. Bring the stew to a rapid simmer and cook until it has thickened slightly. Taste the sauce and add salt if necessary. 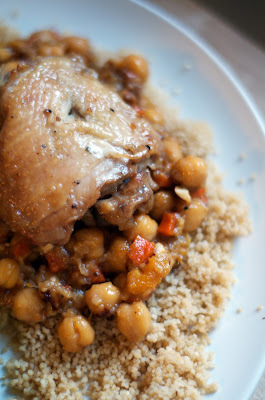 To serve, spread the cooked couscous on a serving platter and arrange the chicken pieces on top. Ladle the stew over top, making sure the chicken pieces each get a good coating. Sprinkle with cilantro and serve. Leftover chicken tagine will keep refrigerated for up to a week.